The white terror — DÃ©jÃ vu about fascism and the reactionary turn of our time. In the summer of 1980, Italian fascists blew up the central station in “red” Bologna. 85 people were killed, more than 200 were wounded. The terrorists had close ties to the Italian military intelligence and NATOs secret stay-behind groups. In Norway in the summer of 2011, two fascist lone wolf terrorist attacks were carried out against the government square block and the Youths Labor party summer camp, claiming the lives of 77 people and wounding more than 300. August 2nd in Italy and July 22nd in Norway are both markers of the worst terrorist acts in post-war Western Europe. 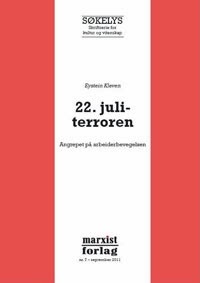 In this guest post, Idar Helle, a member of the Transnational Labour Project in Oslo, reviews the book by Eystein Kleven 22. juli-terroren: Angrepet pÃ¥ arbeiderbevegelsen [The terror of 22nd of July: The attack on the labor movement] (Marxist publishing 2011, 42 pages). To fully understand this, it might be suitable to be specific about the implications this analysis has for the political forecast in Europe: The statement implies that the dominating financial interests today seeking to transform the European Union into a more complete plutocracy and corporate power structure, will have less to fear from neo-fascist governments than in a social Europe. And if the Troika and the creditors on Wall Street and at the Frankfurt stock exchange would have to choose, they would — every day throughout the whole year — prefer Golden Dawn’s mob rule to Syriza and the attempt to organize the Greek and the European community against the interests of capital. The leading theorist of the Frankfurt School, Max Horkheimer, expressed the essential point like this in the 1930s: “Whoever is not prepared to talk about capitalism should keep quiet about fascism”.